MICHAEL GERSHON IS not a people doctor. "Humans are wonderful, but they make lousy experimental animals," says the Columbia Presbyterian scientist. "I work with vermin." Yet in the past few months, thousands of letters have asked for his advice on all sorts of human maladies, from ulcers to gas pains. Fan mail began flowing in when Gershon was featured in the science section of The New York Times (Jan. 23, 1996). Fame can happen when work titled "Do developing enteric neurons need endothelins?" is transformed into a really great read. Sandra Blakeslee's story explained why ailments such as ulcers and chronic abdominal pain aren't all just in our heads but are also the work of the gut's little-known nervous system. The sequel to that story was a wave of letters and calls. Why so many? "You'd be upset, too, if your gut had you chained to the toilet," says Gershon. "The typical letter says 'I've seen six doctors, three of whom tell me I'm a nut or give me tranquilizers that put me asleep but don't change my gut. What can I do about it?' they ask. Or they tell me my research is their problem." In part, he understands. "When I call up the NIH to check on my grants, I become painfully aware of the influence the brain can have on the gut." So Gershon refers patients to his colleague Joe Sweeting at Columbia's new Center for Intestinal Dysfunction. "I haven't asked if he likes me or hates me for sending him all this traffic," says Gershon. Occasionally, however, a wicked sense of humor threatens to overwhelm him after reading hundreds of letters about bowel problems. "One woman called me saying, 'Doctor, you've just got to do something for me. I've been full of gas for 40 years. What do I do?'" recounts Gershon, who resisted the temptation to prescribe flatulence and listened sympathetically. "But I'm a mouse doctor," says the scientist. He studies the relatively unpublicized "second little brain in the gut," which can independently control the gut's behavior and talk back to the big brain in the skull. On the cellular level, Gershon is tracing the development of the bowel's brain in the embryo--work he says suggests that congenital defects in the bowel could contribute to problems such as Crohn's disease and irritable bowel syndrome. "It is a message of hope that has brought me thousands of letters this month," Gershon told a congressional hearing this spring. "Desperate people are out there. Drugs to treat the psychoses of the brain in the bowel will soon be forthcoming. 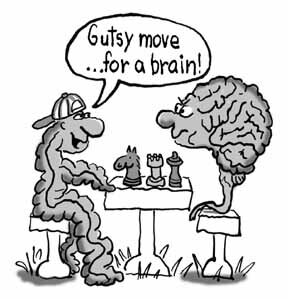 We are beginning to realize that research on how the mind makes the gut go wrong may have been misdirected. The bowel may not misbehave because a person is crazy, but a misbehaving bowel can drive anyone mad." Or as Blakeslee put it in the Times, "Like Siamese twins, the two brains are interconnected; when one gets upset, the other does too." That's one reason why these disorders have been frustrating for patients and difficult for doctors to pin down. Take ulcers, for example. "Did the anxiety cause people to get Helicobacter pylori [the bacteria responsible for the majority of ulcers] or did the bacteria make them anxious?" asks Gershon, "It's pretty clear that the bacteria make people anxious. If your gut is burning, it's nerve-wracking." That kind of logic has the public intrigued. It also has brought four book offers (three for the lay audience), a persistent offer to serve as his agent, calls for television appearances, requests for interviews as far away as Brazil, and, as seen above, some interesting correspondence. That's the untold side of a science story: what happens when research written for one's colleagues becomes public domain. The public responded right before the March due date for NIH grant applications, a rather hairy time for any biomedical researcher. And, of course, there was that book agent on the line again. "He told me I'm losing a lot of money because I'm letting the moment when I'm hot go by," laughs Gershon. "He had a lead for a six-figure contract for a popular book on the enteric nervous system. I just have to figure out how someone like Lewis Thomas would write it." But judging from his recent testimony before the House, he shouldn't dismiss the idea. Gershon's newfound prominence afforded him the opportunity to address Congress, in a pitch for continued funds for basic science. "There is an enemy among us," he stated, "that yearly extracts a greater toll from our people than the Russians ever did, or ever are likely to do. ... I am referring to the army of disease." With the ability to communicate to legislators the importance of supporting the struggle against that enemy, this once-obscure researcher may be an effective people doctor of a different variety. RUTH COXETER has written about science and technology for Business Week, reported for Fortune, and worked as an editor for Neuroscience and the Journal of Cell Biology.